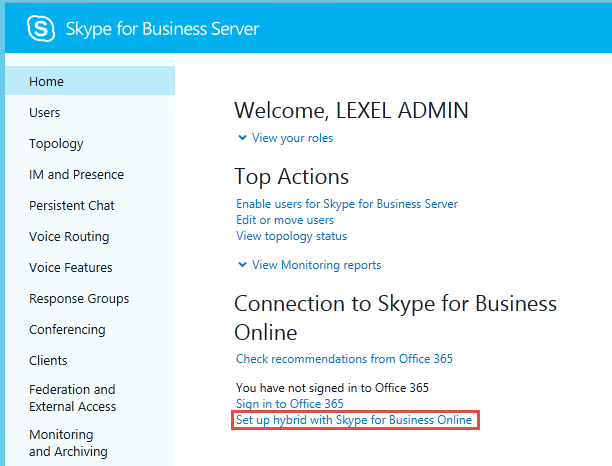 Did you deploy Lync or Skype for Business Online before deploying Skype for Business (Lync) Server on-premises? 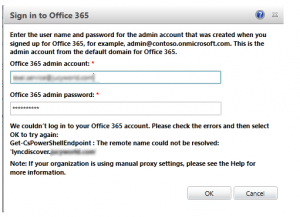 And now you’d like to move your online user accounts to your on-premises server deployment? Here’s how! Disclaimer: this article is a work in progress, put together from lots of very untidy notes from the field. 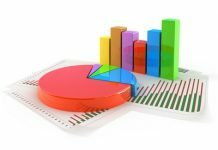 I will improve the article as I test it in the field, and welcome any feedback and experiences. 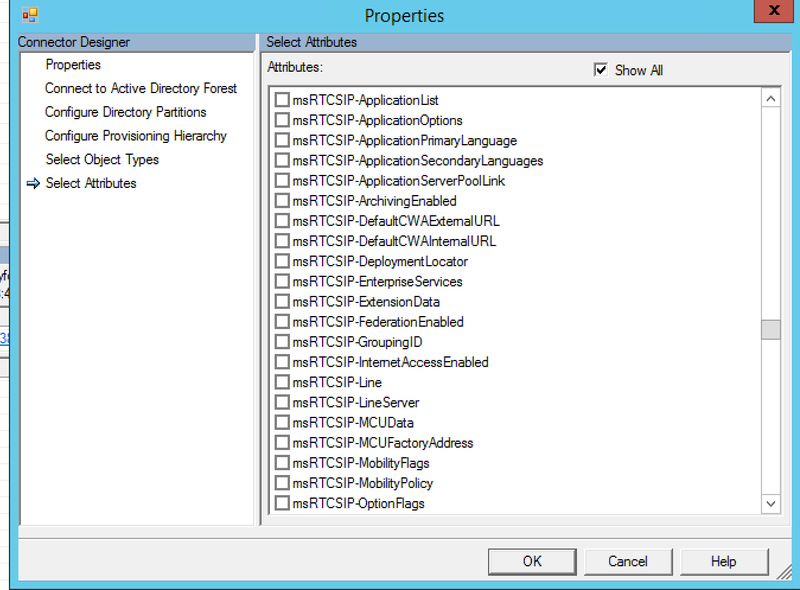 If you installed Azure AD Connect before Skype for Business Server, chances are some of the related attributes are not configured for syncronisation. This article details the attributes that you should be syncing. There are two options when configuring Hybrid. 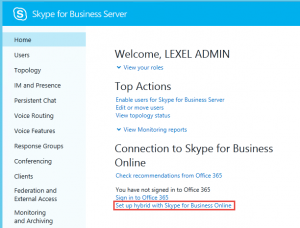 In Skype for Business Server a wizard takes care of most if it for you, however there may be cases where you need to do this manually, for example if you are running Lync 2013 Server. 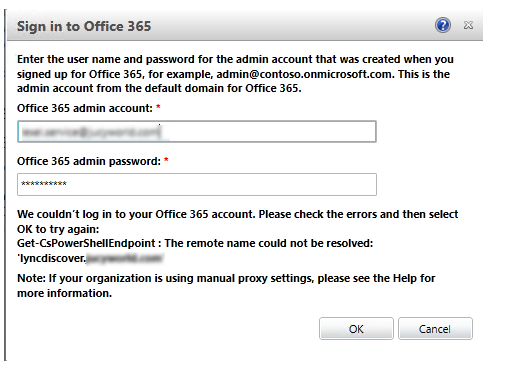 Microsoft recommends you sign in with the admin account that was created when you signed up for Office 365, but in practice it appears any admin account will work as long as it is an onmicrosoft.com domain e.g. 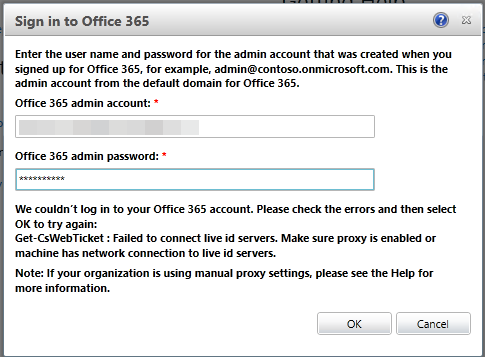 user@customer.onmicrosoft.com The reason for this is a lyncdiscover lookup to SfB Online is used when connecting – some more info here. If you have an account using your real domain, this will fail since it resolves the on-premises deployment. This user may also need to have SfB Licence, but I havent 100% confirmed this. Append the following string to the URL: /HostedMigration/hostedmigrationservice.svc. 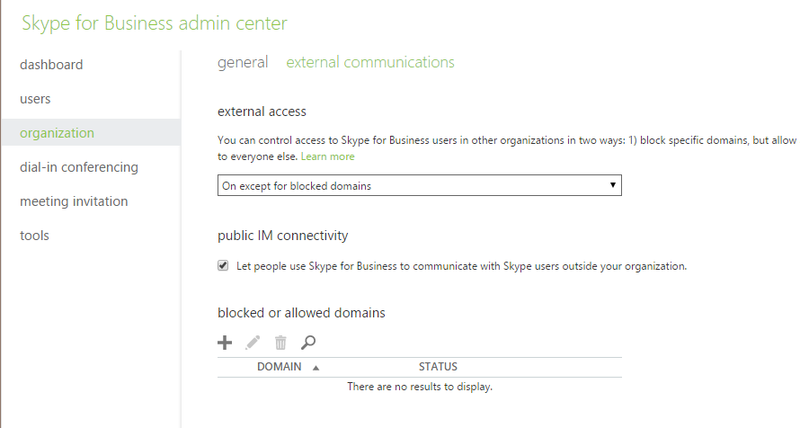 New-CSHostingProvider -Identity "Skype For Business Online" -ProxyFqdn "sipfed.online.lync.com" -Enabled $true -EnabledSharedAddressSpace $true -HostsOCSUsers $true -VerificationLevel UseSourceVerification -IsLocal $false -AutodiscoverUrl "https://webdir.online.lync.com/Autodiscover/AutodiscoverService.svc/root"
Cutting over from SfB Online to on-premises hybrid requires the that the on-premises deployment becomes authoritative. 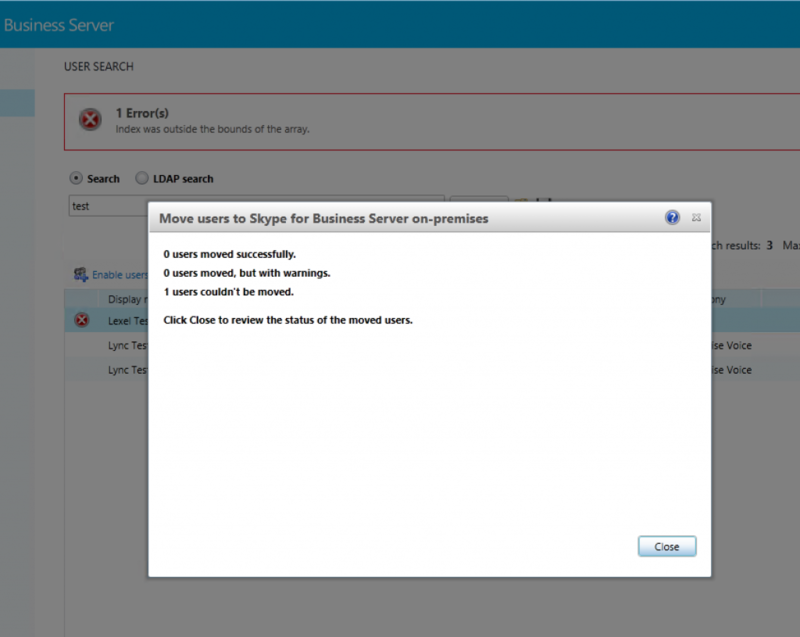 Once the redirection from on-premises to SfB Online occurs, sign-in details will be cached so the reliance on the Edge server for sign-in is not required each time the user logs in thereafter. Obviously the Edge server will be required to redirect federation requests and to communicate between on premises and SfB Online users. $Enable = Enable-CsUser -Identity $UPN -SipAddress $SipAddress -HostingProviderProxyFqdn "sipfed.online.lync.com"
Import-Module LyncOnlineConnector $credential = Get-Credential $session = New-CsOnlineSession -Credential $credential Import-PSSession $session –AllowClobber $UserIdentity = "user@domain.com" $FePool = "pool01.domain.com" $o365AdminUrlPrefix = "admin0f" Move-CsUser -Identity $UserIdentity -Target $FePool -Credential $cred -HostedMigrationOverrideURL "https://$o365AdminUrlPrefix.online.lync.com/HostedMigration/hostedmigrationservice.svc"
Move-CsUser -Identity $UserIdentity -Target $FePool -Credential $cred -HostedMigrationOverrideURL "https://$o365AdminUrlPrefix.online.lync.com/HostedMigration/hostedmigrationservice.svc"
Scheduled meetings are not migrated from online to on-premises. Users will need to reschedule these meetings after being moved or use the Meeting Migration Tool. Migrating users from on-premises to online may utilise the Meeting Migration Service. 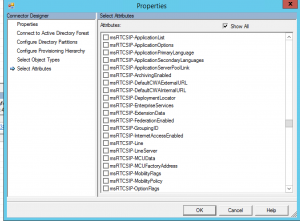 If the permissions are not correct, resolve then recycle the LyncIntManagement IIS Application Pool to ensure it clears the MSOIDCLI state. Next articleSkype for Business is now Microsoft Teams!? Quick question – what if you just enabled the users on prem, rather than enable online first and then move? You would have an online account and on prem, but are there any downsides to that? You would use Azure AD Connect to sync an on-prem user object to an O365 representation of that user. You can use SFB Hybrid to to make moving users to and from Online easier.